"This giant sandwich is perfect for a party or a picnic." Remove bread dough from the packaging and pinch ends together to create a ring. Place the ring in the prepared pan. Bake in the preheated oven until golden brown, 30 to 35 minutes. Transfer pan to a wire rack to cool, about 20 minutes. Cut cooled bread in half using a serrated bread knife. Mix 1/3 cup olive oil with Italian herbs in a small bowl; brush over cut sides of the bread using a pastry brush. 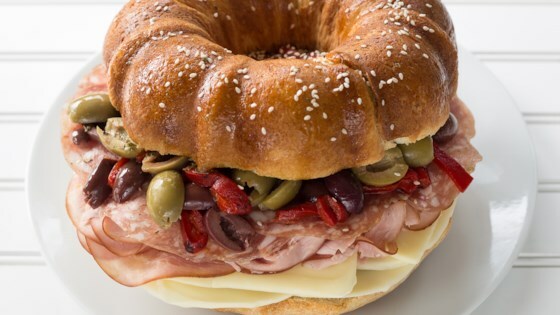 Arrange provolone cheese, mozzarella cheese, ham, salami, green olives, black olives, and red peppers over the bottom half of the bread. Cover with top half of the bread. Brush the top with 1 teaspoon olive oil; scatter sesame seeds on top. Cut into slices before serving. Tasty & popular party pinwheels!